Granola bars pair well with peanut butter. Peanut butter packs a lot of nutrition, with 4 g of protein, about 8 percent of the daily Vitamin E requirement and only 94 calories in 1 tbsp. According to the National Peanut Board, kids eat 1,500 peanut-butter-and-jelly sandwiches by the time they finish high school. If you're looking for a way to give them a little more variety along with the peanut butter, ditch the plain white bread and think about fruits, veggies, crackers and even an occasional cookie to pair with the popular spread for a delicious 100-calorie snack. Mix 1 tbsp. of peanut butter with a few drops of plain soda water or seltzer water to make it of dipping consistency. Add raw vegetables and snack away. Mix or match six 4 1/2-inch celery sticks, three sweet or bell pepper rings, 3 1/2 inches in diameter and 1/4 inch thick, six cucumber slices, two cauliflower florets or three zucchini slices. Decrease the peanut butter to 2 tsp. and serve five times the amount of the veggies. Try flavoring the peanut butter with a smidgen of dried ranch dressing mix. Combine 2 tsp. of peanut butter with fruit. Spread it onto half of a small unpeeled apple, 2-3/4 inches in diameter. Switch to crunchy style to dip 10 seedless red or green grapes. Slice an extra-small banana, one that is less than 6 inches long, in half. Spread peanut butter on one half, or make snacks for two children. Mix crunchy peanut butter with a few drops of soda or seltzer water and pour it over 1/3 cup of pitted sweet cherries. Serve it in a paper cup with a plastic spoon. Spread 2 tsp. of peanut butter on three saltines, half of one graham cracker, 15 fish-shaped crackers, two round whole-wheat crackers, two round snack crackers, three rounds of melba toast or two plain rice cakes. Spread 1 tsp. of peanut butter on a hamburger or hot-dog bun half, a slice of whole-wheat toast, or half of a cinnamon-raisin English-muffin. Add a 1-tsp. squeeze of grape jelly to the peanut butter on a plain biscuit half. Give kids a sweet treat with peanut-butter cookies baked from refrigerated dough. One cookie contains 60 calories, so you can add 2/3 cup of apple slices, 10 seedless grapes, or 1/3 cup of sliced banana. 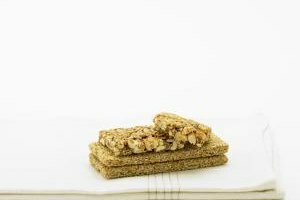 One crunchy peanut-butter granola bar comes in at 90 calories. Half a cup of peanut-butter-crunch breakfast cereal totals 75 calories. Let your kids eat it plain, accompanied by a few grapes or apple slices, or add a splash of low-fat milk. What Can I Use in Place of Sour Cream?